Learning how to find google pagerank for a site is valuable for those who are interested in search engine optimization, this tutorial will show you how to find the PR of a site as well as an individual page. To get an idea of the over PR of a site it is best to check the PR of the homepage. You can do this by visiting the website “www.checkpagerank.net” and in the “Domain name” box type the home page of the website that you want to check, in this case “www.bbc.co.uk”. Enter the CAPTCHA code beneath this and click “Check”. A new page will load and it will tell you that the pagerank of the BBC site is 9. 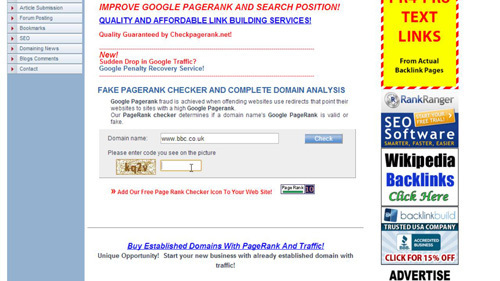 That is how to find google pagerank for a site. Finding the PR of an individual page is a similar process. Go back to the previous page and enter the address for the page into the “Domain name” box, in this case “www.bbc.co.uk/news”, enter the CAPTCHA again and on the new page you will see that the individual page also has a PR of 9.